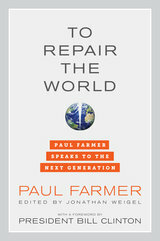 To Repair the World: Paul Farmer Speaks to the Next Generation collects, for the first time, short speeches by the charismatic doctor and social activist Paul Farmer. One of the most passionate and influential voices for global health equity and social justice, Farmer encourages young people to tackle the greatest challenges of our times. Engaging, often humorous, and always inspiring, these speeches bring to light the brilliance and force of Farmer’s vision in a single, accessible volume. A must-read for graduates, students, and everyone seeking to help bend the arc of history toward justice, To Repair the World challenges readers to counter failures of imagination that keep billions of people without access to health care, safe drinking water, decent schools, and other basic human rights. For a limited time only, UC Press is running a book giveaway over at Goodreads. Enter to win one of five SIGNED copies of this important book. Visit Goodreads before June 10 to enter. And in the meantime, click here to read a recent interview with Paul Farmer: “The Big Idea on Health Care.” You can also watch Paul Farmer’s recent appearance on Charlie Rose by clicking here.